Come savor the restful, romantic vacation of your dreams. Snuggle with someone special in a big canopy bed by a crackling wood fire or soak in a bubbly jacuzzi. Explore miles of secluded hiking trails holding hands. Soak up some sun on our man-made beaches then plunge in our private swimming lake. Wander the back hills on horseback. Tune your tennis and golf games. Or search out antique treasures among our many shops. In winter, cross-country and downhill ski. Then relax with a horsedrawn sleigh ride. 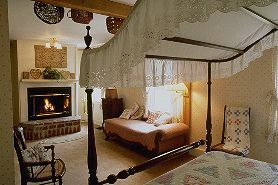 Our Bed and Breakfast is one of Vermont's most historic, with a large heirloom quilt collection. Our Contemporary American cuisine features fresh Vermont products and our wine list has won five Awards of Excellence. We were voted "Inn of the Year" by inn-goers. And we've been featured in Country Living, Yankee, Gourmet, and Country Home. Our rates start at $131 for two including breakfast. Substantial discounts all Spring and midweek non-peak. And we're only five miles outside picturesque Woodstock. 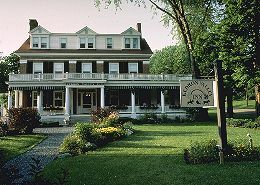 This and other Woodstock Bed and Breakfast Inns can be found here in The Register.